The Enhanced Aggregate Spread (EAS) comes from Robert Dieli, and most of the following description of this indicator, and why it works, is from personal communications. The EAS can signal, as much as nine months ahead, when either a cycle peak (recession start) or a cycle trough (recession end) is likely to take place. Armed with that information, decision makers can make appropriate plans. As of this writing (May 2016), it signals that it is highly unlikely for a recession to begin before the end of 2016. Short-Term Unemployment Rate (27 weeks or less). The Financial Spread is the 10-yr Treasury Note Yield minus the Federal Funds Rate. The Enhanced Aggregate Spread is the difference between the Financial Spread and the Real Spread expressed in basis points (bps). It signals an upcoming cycle peak when its level is at, or near 200 bps and falling. The 10-yr Note is a proxy for investor and business sentiment and their willingness to invest in productive activities. After all, people borrow money to spend it. The pace at which they borrow is based both on current and prospective returns. So, to the extent that interest rates change, we get insight into how people think the economy will perform and how much they expect to be paid to take on risk. The Fed Funds Rate is a policy tool designed to regulate the pace of banking activity, and by extension economic activity. It is classified as a leading indicator because one could reasonably expect that actions taken by the FOMC to raise and lower the rate are intended to promote or dissuade lending activity in the future. The Financial Spread is the active element. As it expands and contracts it tells us something about the willingness and the ability of people to undertake the financial transactions associated with economic growth. When the Financial Spread is narrow, or negative, it means that the channels of finance are constricted and that the ability to grow will be constrained. The Inflation Rate is a proxy for the friction in the system that naturally occurs as resource utilization is maximized. After a while, all that gets generated is heat in the form of higher prices. The Unemployment Rate is a proxy for the capacity of the economy to grow. More people are needed as well as more financial resources to make the economy larger. Productivity does play an important role, but those effects are secondary in the short run when it comes to making the economy larger. As the Unemployment Rate falls towards its structural lower limit it becomes more difficult to generate growth. The Real Spread is the other active element. When it narrows, or becomes positive, it is telling us that we are both running out of resources to apply to growth and that some of those efforts are not producing growth but heat. The Enhanced Aggregate Spread is the difference between the Financial Spread and the Real Spread. When both spreads are near zero then the EAS is near zero. The convergence of the two spreads is the key dynamic. Among the reasons why the EAS moves lower as we approach a cycle peak is that the Unemployment Rate moves lower as we approach a cycle peak. This means that we are running out of room to grow without putting pressure on the inflation rate, which in turn provokes a reaction from the Fed. Think of it this way. The 10-yr Note Yield and the Unemployment Rate add basis points to the EAS. The Fed Funds Rate and the Inflation Rate subtract basis points from the EAS. The reason why the EAS goes into recession mode around zero is because the additions and subtractions essentially balance at, or near cycle peaks. 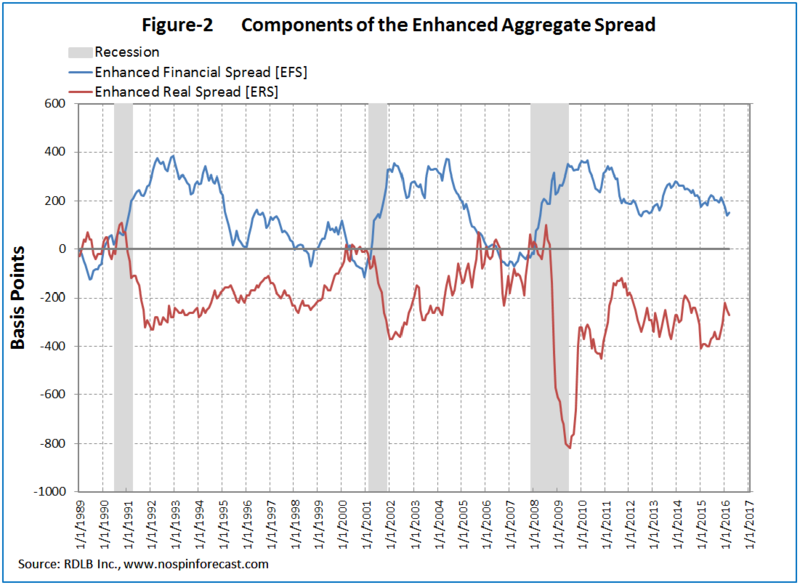 Below are the charts of the Enhanced Aggregate Spread (Figure-1) and of the Real- and Financial Spread (Figure-2) with recessions indicated by the shaded bars. The EAS gave a false positive signal in 1967, a period that saw economic growth slow but not to the point of recession following a tightening by the FOMC in 1966. The EAS changed direction at the end of 1980 recession, and then reversed, signaling further downward pressure on the economy. The brevity of the recovery from the 1980 recession (12 months) was too short an interval to be fully captured by the model inputs. 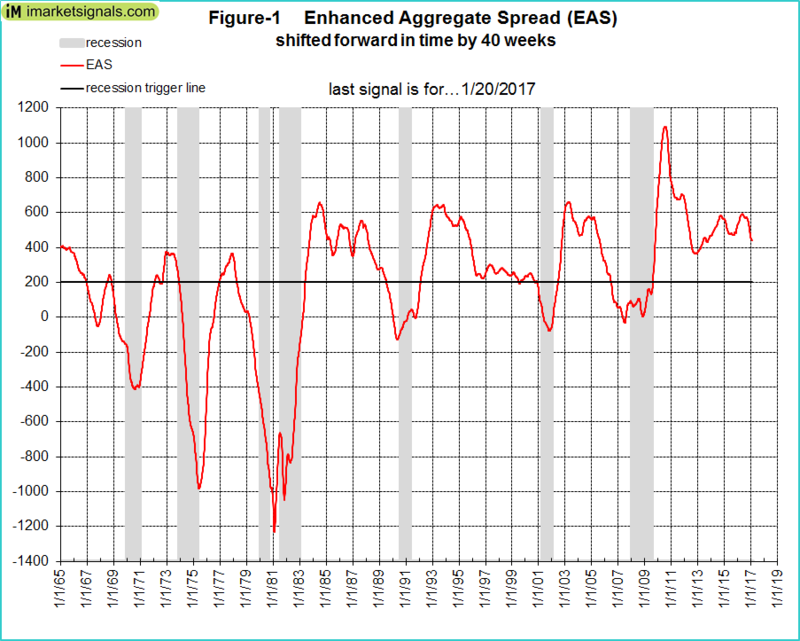 The level and trend of the EAS are important only as they relate to the 200 bps level, which has frequently been associated with the onset of business cycle events. The EAS is not designed to be a measure of economic strength or weakness. The indicator often moves lower as the economy is getting stronger. This is because it is forecasting cycle events, and recession start at cycle peaks. It is fundamentally different from iMarketSignal’s BCI or the Conference Board LEI in this respect. It is designed to be a warning system for the presence of business cycle peak and trough conditions. The current reading is saying that the conditions historically associated with a cycle peak are not present at this time. However, the risk is that we could have entered a period in which the historical conditions do not apply in the same way as before. Prior to 2008 all of the cycle peaks can be directly linked to Fed action. Even though current policy is extreme, rates were also very low under Greenspan. Even indicators that one might claim to be independent of Fed action (such as commodity prices) are often correlated. To be specific, the concern is that for the first time ever, a recession might have started without the active participation of the FED. There were previously no recessions that did not have the FED’s palm prints on their back. The economy has never rolled over into recession; it gets a shove from the FED. This time we have the FED standing in front of the economy with its palms on the economy’s chest. This may prevent the economy from pitching forward (the standard recession entry mode) but it may not prevent the economy from pitching backward. To summarize, the Fed is fighting a recession while using extraordinary efforts. If the EAS remains accurate, this business cycle should continue, even as some policy accommodation is removed. The EAS is updated monthly at nospinforecast.com, and a derivative indicator, the DAGS (Dynamic Linearly Detrended Aggregate Spread) can be followed at iMarketSignals.com.